A woman leading a leaflet campaign about Madeleine McCann has left the girl’s parents distraught. The couple spent yesterday with lawyers and may call in police after Debbie Butler visited the road where they live in Rothley, Leicestershire, to deliver highly inflammatory leaflets to neighbours suggesting that Madeleine was not abducted. “Angry and upset” Kate and Gerry McCann are consulting their lawyers about how to react to last week’s extraordinary late-night leaflet drop which involved 10 people. As well as discussing an action for libel, the McCanns want to know if there are grounds to pursue a harassment action and are considering calling in police. Although single mother-of-two Ms Butler, 45, decided not to post the leaflet through the couple’s letterbox, a copy was sent to Kate’s aunt and uncle, Brian and Janet Kennedy, who live just a mile away in the same village. A source close to the couple said yesterday: “Kate and Gerry are very upset and angry over these despicable lies. They feel they are being persecuted. This time the group has gone too far. “They are now considering legal action over the leaflets. It is a clear case of harassment, indirectly if not directly. It must now become a police matter. However, Ms Butler, who admits involvement in the leaflet drop, said last night: “We just want the case reopened. We are not out to persecute the McCanns. “We haven’t harassed them at all, we have leafleted. We are not harassing the McCanns in any way whatsoever. We are not stalking them. We are getting facts out in the public domain. Ms Butler, of Maidstone, Kent, has a daughter of 23 and an adopted son, aged eight. She is chairman of the so-called Madeleine Foundation, formed in July last year and works closely with the foundation’s secretary, solicitor Tony Bennett, 61, who lives in Harlow, Essex. He and the group tried to bring a private prosection against the McCanns for neglect but it was thrown out of court. In Rothley many of the McCanns’ neighbours said they were disgusted by the insensitive actions of the group. Sandra Thompson, 51, who lives nearby, said: “It is pretty disgraceful that a group writes that stuff and then sends it to the neighbours of Gerry and Kate. In a statement Kate and Gerry, who are both 41, said: “We feel it is important that the general public are made aware that the Madeleine Foundation has no connection whatsoever with our family or those helping us to find Madeleine, or any law enforcement agencies or child welfare organisations. “We also strongly believe that the actions of this so-called organisation do not have Madeleine’s best interests at heart. 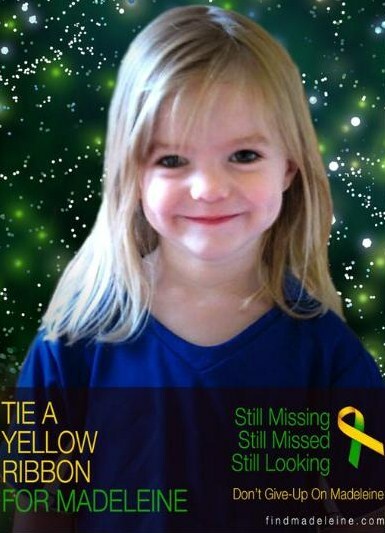 Madeleine was nearly four when she went missing from her family’s holiday apartment in Praia da Luz in Portugal on May 3, 2007, while her parents dined with friends nearby. Yesterday copies of the leaflet that had been pinned to trees and notice boards in Rothley had all been torn down.